After I was really fed up always making the MOSI, MISO, Reset, SCK, Vcc and Ground connection with wires in order to program an Attiny85/45/13, I bought an USBASP programmer (real cheap). Didn’t get that to work, always got the dreaded ‘Yikes, invalid device signature’ message, that is usually a sign of a bad connection. Couldn’t quickly locate it, maybe a rotten cable, but I didn’t want to lose more time so I put together a quick and simple Attiny programmer. I know there are dozens of circuits and designs floating around on the internet, but I just never got around to actually making one, so if you are like me, this is just a little push to tell you to ‘just do it’ it takes maybe 10 minutes from scrap to programmer. I got my inspiration from a Spanish site from a guy that inspired me to build my first Arduino, but when I checked there, the stripboard-illustrations of his programmer were gone. No sweat, just simple to make one myself. The idea is a little piece of stripboard that plugs in the necessary headers of the Arduino. A 20hole x 9 strips piece is enough, but I made that 22 holes, just to give a couple of small ‘wings’ to help me pull it out. The Arduino ISP offers 3 LEDs to keep track of status. I implemented 2: The heartbeat and the Error (D9 and D8). Adding the ‘Programming’ LED is a bit more of a hassle because that needs D7 which is just at the other side of the non standardized gap in the Arduino headers, But if you want you could add a slightly bend pin to slot into D7. The board plugs in easily, but is not completely straight because of how the arduino headers line up, but it works great. Just a word on the capacitor. In order to avoid that the Arduino will reset when the attiny program is uploaded, the reset pin must be kept high. there are two ways how that is usually done: a resistor (120 Ohm) to the Vcc or a capacitor (10uF) between earth and Reset. Both work well. Make double sure and double check that you have not forgotten to make all of the necessary cuts in the stripboard. Check it after each cut, use a multimeter if necessary. After you soldered it all up, check again that there are no stray connections or shorts. The reason for this is that you do not want to short any pins on your arduino or connect any pins to where they shouldn’t be connected. You do not want any of your Digital-Out pins to be connected to Ground when you pull them high. Anyway, build it yesterday and works great. I have programmed more Attiny’s in half a day than I did in my life before. For people that are new to programming an Attiny: The steps are as follows. 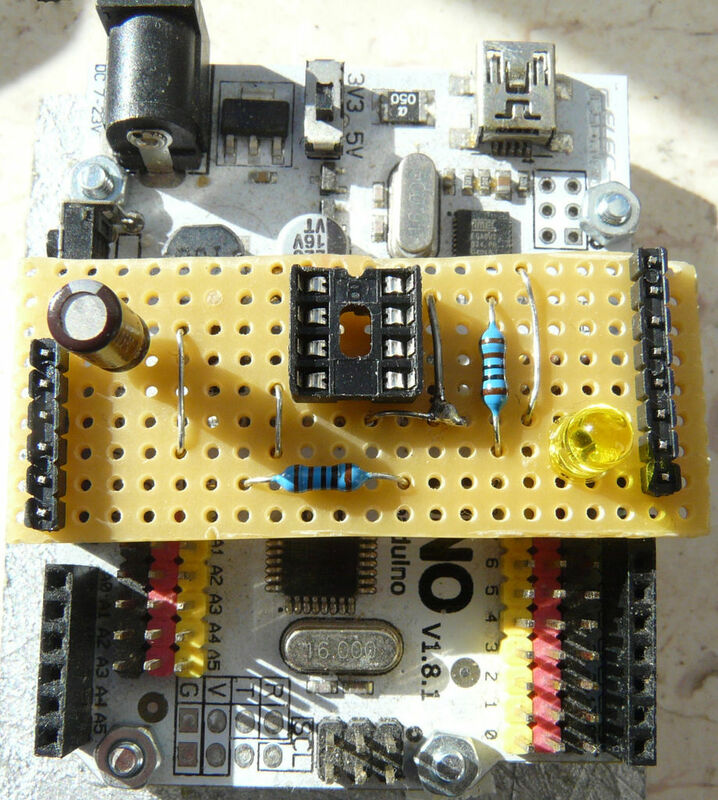 Remove the programming board and upload the ‘ArduinoISP’ program to your Arduino. Insert the program board and load the desired Attiny sketch. You may want to check here or here for more information on the programming. “avrdude: please define PAGEL and BS2 signals in the configuration file for part ATtiny85”. # Added to eliminate the bug to build. Thanks baelza.bubba for putting me on track for that. If you have trouble understanding, check the two pictures. Understand that you dont HAVE to alter the file, it will all work. The alteration is just to get rid of the error messages. Just a tip: when I was programming Attiny’s I used the setting for the 8MHz internal clock and found my timings to be far off. coincidence or not, it seemed they were a factor 8 off (slower). When I tried at 1 MHz, It all seemed OK again. This is caused by the following: The standard operating speed for the Attiny is 1Mhz, and it gets that by dividing the internal oscillator by 8. Where I presumed the 8MHz setting would set the proper fuses to tell the Attiny it shouldnt divide the internal oscillator anymore, it seems that it may not do that. The solution would be to first set the proper fuses by selecting ‘burn bootloader’ That doesnt burn the bootloader, but it does set the right fuses. 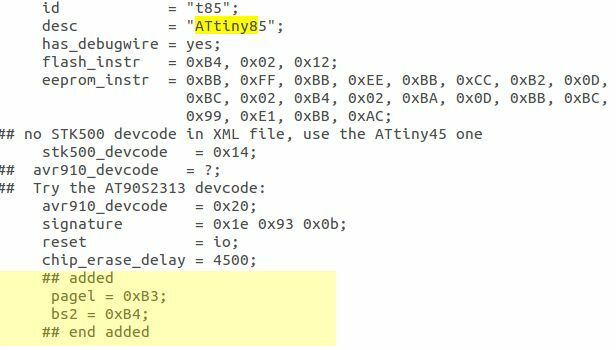 And yet another tip: If you are trying to use the Attiny with the LCD library from F. Malpertida, you may run in some error messages that have to do with the print.h and print.cpp files of the core. These can be fixed. There are two publications on how to do that, but most likely, using the proper core will solve that without having to change anything. Useful info also here.